WELLINGTON, New Zealand (AP) — It was a woolly ride, but three wild rabbits managed to escape rising floodwaters in New Zealand by clambering aboard sheep and surfing to safety on their backs. Ferg Horne, 64, says he’s been farming since he left school at age 15 and has never seen anything quite like it. 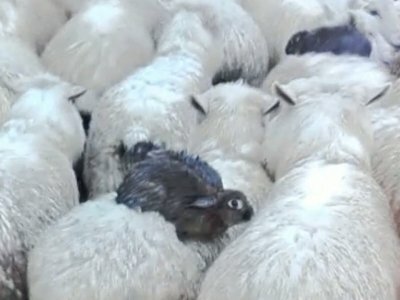 He was trudging through pelting rain to rescue a neighbor’s 40 sheep from the floodwaters on Saturday at their South Island farm near Dunedin when he spotted some dark shapes from a distance. He was puzzled because he knew his neighbor, who was away in Russia attending a nephew’s wedding, didn’t have any black-faced sheep. As he got closer, he thought it might be debris from the storm, which had drenched the area and forced Horne to evacuate his home. Then he saw the bedraggled rabbits hitching a ride — two on one sheep and a third on another sheep. “I couldn’t believe it for a start,” he said. Nobody else would believe him either without proof, he thought, so he got out his phone to take a photo, an image he figured his grandchildren would enjoy. In fact, he inadvertently shot a short video. Nevertheless, Horne managed to capture the moment. He said the sheep were huddled together on a high spot on the farm, standing in about 8 centimeters (3 inches) of water. He said the rabbits looked like they’d gotten wet but seemed quite comfortable and relaxed atop their mounts. Rabbits are considered a pest to farmers in New Zealand, and Horne said that typically when he sees one, he shoots it. “But they’d showed so much initiative, I thought they deserved to live, those rabbits,” he said. Horne herded the sheep to a patch of dry ground on the farm about 50 meters (164 feet) away. The sheep didn’t like it. “As they jumped through the water, the rabbits had a jolly good try at staying on,” Horne said. He said the rabbits appeared to cling onto the wool with their paws. As they approached the higher ground, the rabbits fell off but managed to climb a hedge to safety. Horne returned later that afternoon. The floodwaters were receding, the sheep were all safe and the rabbits were long gone. Horne said his home had also remained dry. He then sent his video to his son, who sent images to the local newspaper and posted them on Facebook, as Horne doesn’t have his own page. “From then on it’s just gone crazy,” he said.